MOSCOW Masked men stormed a gay club in Moscow, injuring three people in what independent monitors say was the seventh violent attack against gays reported this year. Police said they were scanning security camera footage of the Thursday night attack to identify the attackers, whose faces could be seen briefly before donning their masks and hoods. A young woman was hospitalized with broken glass in her eye, Moscow police said. The attackers wearing medical masks and hoods broke in the 7 Freedays club late Thursday during a "Coming Out" party, the club's art director Viktoriya Soto said Friday. The attack appeared to have been well organized and the attackers were "especially aggressive" toward women, she said. Russia's leading gay rights campaigner expressed skepticism about officials' resolve to combat hate crimes against gays and lesbians. Russia has no legislation specifically defining hate crimes against any group, and three cities, including St. Petersburg, have recently passed laws imposing fines of up to $150,000 for providing minors with information on homosexuality, which the laws term "homosexual propaganda." "Those who stand behind it have apparently tried to find an excuse for a ban on gay propaganda" in Moscow, Nikolai Alexeyev said. Alexeyev pointed out that the attacks follow calls by Russia's dominant Orthodox Church to ban gay clubs and make the anti-gay laws federal. Although homosexuality was decriminalized in 1993, discrimination against gays remains strong in Russia. Attempts to hold gay pride events have provoked violence by police and militant Orthodox activists. 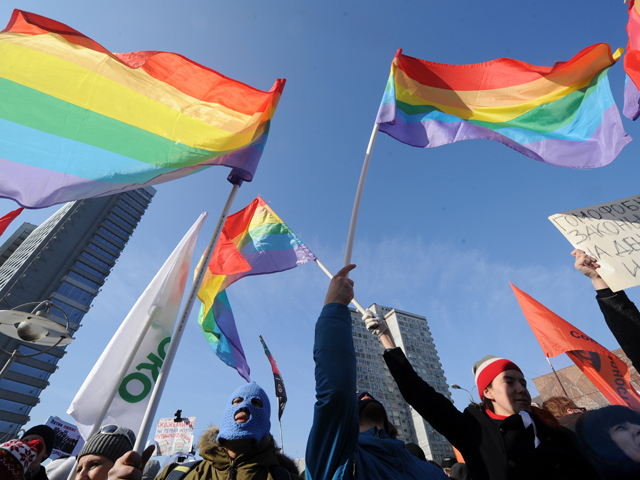 Russian hate crimes monitor Sova reported six attacks on gays this year, but said the real number is much higher since many attacks are unreported due to the stigma.